by a qualified native Spanish speaker. Whiz Ninos is a new program with in the prestigious Whiz Kidz Preschool at our Scottsdale campus. The founder Ms. Martha, was raised in a bilingual home in California, her mother being native of Mexico spoke only Spanish to her and her siblings. Thanks to that invaluable cultural exposure, Martha is a native fluent Spanish speaker, now as a mother of her 3 boys she values the importance of giving her and other children the same exposure and experience of speaking Spanish! 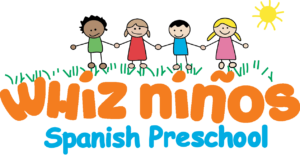 Whiz Ninos is not just a Spanish class, it is a traditional preschool experience all conducted in Spanish by a qualified native Spanish speaker. Whiz Ninos follows the yearly curriculum plan directed by Ms Cathy, the Whiz Kidz Program Director. Our stimulating program includes play based, age-appropriate academics, arts and learning experiences all in Spanish! It’s easier for a developing child to acquire a foreign language. Children are “sponges” for learning and learning a second language comes much more natural at a young age. Research shows that there is a “critical period” for language acquisition, when your brain is primed to learn. Spanish is the second most spoken language in the world with English being the third most spoken language! So learning a foreign language as a child they have a lifetime to benefit from cross-cultural friendships, broader career opportunities as adults, exciting travel adventures and deeper insights into other cultures and how others see the world. Years ago people believed that learning a second language would confuse a child. Now, research shows that children who study a foreign language perform better in their native language than non-bilingual students, as measured on standardized tests. 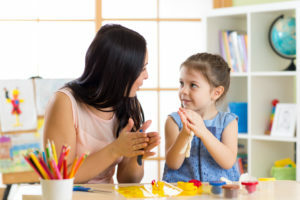 Other research has shown that children learning a second language start reading earlier, and the advantage increases the earlier they are exposed to the second language. Much has been written about how many jobs in the future will be automated – with tasks requiring ingenuity and creativity being left to humans. How then to build creative thinking skills in children? One of the surprising ways is by learning a second language. Several studies have demonstrated greater creativity and problem solving skills amongst bilinguals. Learning a foreign language helps children see the world through different lenses. The ability to consider multiple viewpoints to a problem is a cornerstone of creative problem solving. Don’t wait, give your child the advantage and opportunity of a lifetime! Enroll TODAY in Whiz Ninos! **TUITION IS DUE in advance by the first of the month via Tuition Express. $5 credit card decline fee and $35 returned check fee.